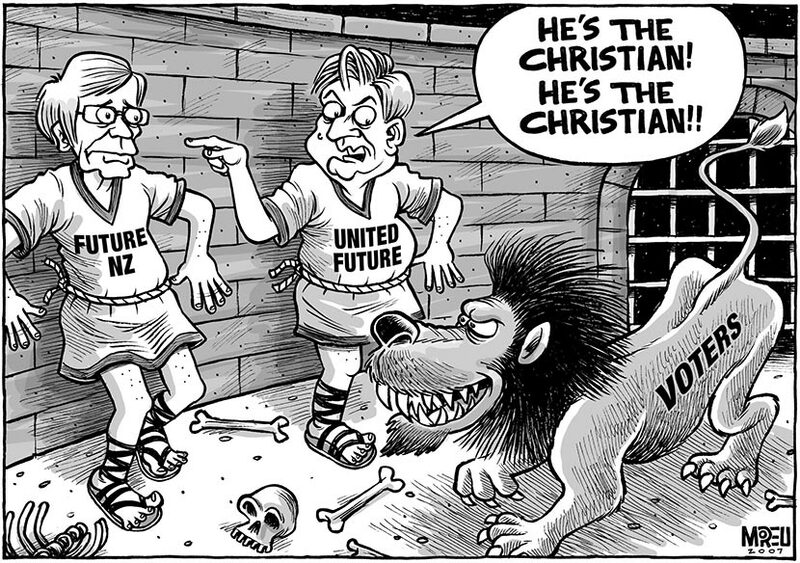 In this 2007 cartoon, based on the idea of throwing Christians to the lions, United Future Party leader Peter Dunne points out to the lion (representing the New Zealand voters) that it is Gordon Copeland who is the Christian. Dunne felt that support for his party had suffered after his 2002 alliance with the Copeland-led Christian party, Future New Zealand. Overt association with religion has not helped many New Zealand politicians and in some cases it has damaged their political support. Being agnostic or avoiding the issue seems to be more acceptable to most of the electorate.